Special Containment Procedures: The cave in which SCP-3282 currently resides in is to be restricted from public access, under the guise of a wildlife conservation effort. A surveillance cabin accommodating three personnel has been established nearby, and is to be resupplied on a monthly basis. Personnel stationed at this cabin are to keep nightly dream journals, and upon noting the presence of SCP-3282-2, are to immediately report the manifestation to the closest Foundation base. On the night of each full moon (approximately every 29 days), a specialized containment team is to transport one unconscious D-Class personnel member to the cave. The team is to deposit the D-Class individual at the mouth of the cave, and the following morning recover any humans who have been regurgitated by SCP-3282 at the same location. Should an SCP-3282-2 manifestation be reported before the next full moon occurrence, the above procedure is to be carried out the night following the report. Any former SCP-3282-1 instances are to be held in quarantine for three months, during which their brainwave patterns during sleep are to be analyzed twice weekly to detect any abnormalities. Any coherent speech uttered by these individuals while asleep is to be recorded and added to existing documentation to determine any repeated vocalizations. Should an SCP-3282-1 instance be conscious upon recovery, they are to be immediately interviewed for information regarding SCP-3282-2. Should SCP-3282 manifest outside of its usual cave, Foundation agents are to disseminate disinformation through social media and public information channels indicating that any damage caused by SCP-3282 is the result of natural disasters. Amnestics are to be administered to any civilians who happen to witness SCP-3282 directly. 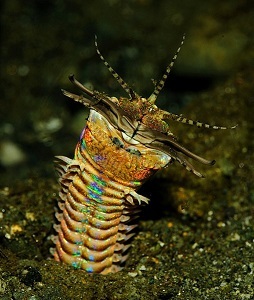 Description: SCP-3282 is an abnormally large, terrestrial member of the species Eunice aphroditois (Bobbit worm), measuring 2.8 meters in diameter and approximated at a length of 11 kilometers. SCP-3282 currently resides in a burrow (measured at 13 kilometers long), opening at a cave near the base of the Gyala Peri peak of the Himalayan mountains. When hunting, SCP-3282 will emerge from its burrow and attempt to seek out a human individual, which it will then attempt to swallow whole. SCP-3282 will then retreat to its burrow, and enter a period of stasis lasting approximately 30 days. Upon waking from this period of dormancy, SCP-3282 will then regurgitate the previously-consumed individual (designated as an instance of SCP-3282-1) and repeat the hunting behavior. Observation seems to indicate that most recovered instances of SCP-3282-1 do not suffer any negative effects after being consumed by SCP-3282, except difficulty falling asleep during the first few weeks after regurgitation. In some cases, SCP-3282-1 instances have additionally exhibited mild short-term memory loss and personality changes (usually in the form of periods of flat affect1 and non-responsiveness). These effects have not been noted to last longer than two months. SCP-3282-1 instances are recovered seemingly without having experienced any exposure to foreign bacteria or digestive fluids, and typically react to the experience as if having awakened from a short rest. During periods of SCP-3282 stasis, humans in surrounding areas may experience recurring dreams involving similar themes and SCP-3282. Recorded dream content tends to focus on a "holy journey", usually involving the dreamer leaving their current location to seek out the Himalayan mountains. Some affected dreamers report finding a large city (designated SCP-3282-2) built into the mountains, populated by humans wearing clothing from various time periods. The city is bordered by tall stone walls patrolled by smaller versions of SCP-3282. SCP-3282-2 is described as a "city of builders", and all encountered humans are frequently remembered as being seen making additions or repairs to the city's infrastructure. Many of these contributions include miniaturized versions of well-known historical landmarks and monuments (e.g., the Hanging Gardens of Babylon and the Arc de Triomphe de l'Étoile of Paris). Foundation research has determined that these dreams involving SCP-3282-2 correlate with the feeding cycle of SCP-3282. It is currently theorized that the dreams manifest when SCP-3282 is close to emerging from a stasis period and will soon seek new prey. Addendum 3282-1: SCP-3282 was first brought to Foundation attention when a mountain-climbing team was attacked by it during an expedition. The team later reported the loss of one of its members and the "terrifying encounter with a giant worm" to a local news station, prompting Foundation agents to investigate the case. Two Mobile Task Force teams were later dispatched, and upon locating SCP-3282's burrow, attempted to engage the entity after setting up preliminary defenses. Conventional weapons and tranquilizers were found to be ineffective, and SCP-3282 injured three personnel. However, SCP-3282 then regurgitated the previously-consumed civilian, in favor of then swallowing one of the MTF personnel members. A retreat was called, and the civilian, a Mr. ████ ███████, rushed to a Foundation facility to receive medical attention. Mr. ███████ was extremely agitated and incoherent upon awakening, and was quickly sedated and kept on an IV feeding system for the remainder of the month. The MTF personnel who had encountered SCP-3282 later reported experiencing recurring dreams involving SCP-3282-2, and it was determined by Site Director █████ that Mr. ███████ should be returned to SCP-3282 upon the MTF's following attempt to recover the lost squad member, to observe whether the action would have any corresponding effects on the dreams. The MTF teams returned to SCP-3282's burrow, and upon laying the unconscious Mr. ███████ at the cave entrance, were greeted by SCP-3282, which deposited the previously-lost personnel member on the ground, swallowed Mr. ███████, and returned to its burrow. A Foundation cabin was established near the burrow to monitor SCP-3282's activity. Approximately 20 days after Mr. ███████ had been taken by the entity, he was deposited at the cave entrance, and had apparently recovered from his previous agitation and incoherence. Addendum 3282-2: Some former SCP-3282-1 instances, notably those with high Openness2 scores in five factor model (FFM) tests, report remembering an "end to the dream" prior to first awakening after encountering SCP-3282. These individuals (tentatively designated SCP-3282-1A) consistently describe walking to the center of SCP-3282-2 and discovering a large, temple-like structure, with a single pedestal displaying a closed book resides in the innermost room. In two recent cases, SCP-3282-1A individuals have also noted that the book contains artistic depictions of humanoids with insectoid features. Reported observations include a feminine figure with two feathery purple antennae, and a heavy-set entity with wings resembling those of a mosquito. A single short line of indecipherable pictograms, accompanied by an ornate circular seal, is present underneath several portraits. Discussion has begun regarding the possibility of allowing Foundation researchers to train and volunteer for becoming SCP-3282-1 instances, to further the collection of detailed information about SCP-3282-2. 2. Described as a person's intellectual curiosity, creativity, and preference for novelty and variety. 3. Regardless of the dreamer's first language, the contents of the book will always be understandable.